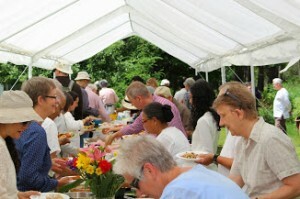 You can participate in the Ottawa Buddhist Society (OBS) in different ways. You can subscribe to our E-Mail List hosted by Mail Chimp from which you will receive regular newsletters. You can also choose to Become a Member even if you are not a Buddhist! Becoming a member means you are interested in being a part of our community that actively supports individual and group meditation practice. Members also have a direct say in influencing decisions on how the OBS operates. Because the OBS is run by volunteers, members are encouraged to help out in events and activities according to their abilities, resources, and availability. Whether or not you are a member, the community at large is welcome to participate in events and receive news and updates. If you are interested in receiving OBS updates on activities, you can access this information through our web site. The OBS welcomes those with a desire for the kind of support we can offer: instruction in meditation and the teachings, a place to sit, and a community with which to practice. Our events are open to the community at large. We welcome people to come and go, and to practice at a level that suits them. The OBS operates solely on dana, or donations received – people give what they can and when they like. Donations that contribute to the Society’s well-being are always gratefully accepted but not necessary to be part of our community. The OBS wishes that no one ever be turned away from any practice-related function because of a lack of finances. In whatever way you choose to participate, your contributions are always welcome. If you wish to contribute to this society’s financial well-being you can make a one-time donation or become a supporting member by donating a recurring pledge. All donors will be given a tax receipt at the end of the year. Please note, as a registered charity and according to Canada Revenue Agency regulations, OBS membership fees are not eligible for a tax receipt.